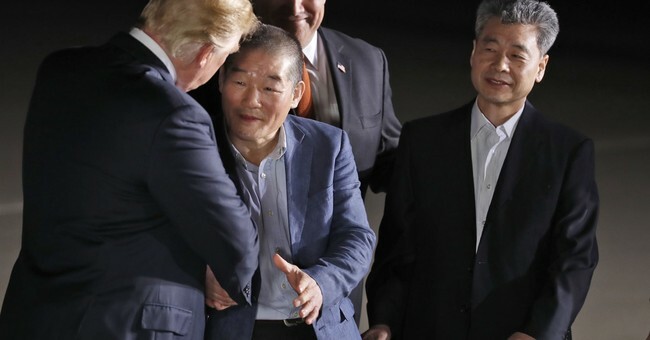 At 3:02 am Thursday morning, President Trump welcomed three American hostages previously held in North Korea back to the United States and celebrated their freedom. "This is a great honor. Hopefully everything is going to work out at the highest level. We want to thank Kim Jong-un, who really was excellent to these three incredible people. They are really three incredible people. And the fact that we were able to get them out so soon was really a tribute to a lot of things, including a certain process that's taking place right now. And that process is very important," President Trump said. "So we will see what happens. We have a meeting scheduled in a very short period of time. You'll be hearing about it soon. We have the location set. And we will see if we can do something that people did not think was going to happen for many, many years, and a lot of bad things could have happened in between," he continued. "I just want to say this is a special night for these three really great people. And congratulations on being in this country." When asked how it feels to be home Kim Dong-Chul, who was held in a North Korean labor camp, said it was like a dream. "It's like a dream. And we are very, very happy," he said. The hostages were released shortly after a meeting between Secretary of State Mike Pompeo and North Korean Dictator Kim Jong Un. The summit between President Trump and Un is set for June, although the exact location and date have not been announced. UPDATE: Singapore has been announced as the location.